Both ninja monsters and samurai spirits make their appearance, this week. Reference art for “Evil-eye Hades Emperor, Shiranui “Mukuro””. The 2 Deck Sets come with all 47 Touken Ranbu Men across both sets. AUTO (RC) 1/Turn GB1: During your turn, when a dominated unit attacks, you may choose a face-down card in your bind zone, and put it into your soul. If you do, this unit gets Power+5000 until end of turn. 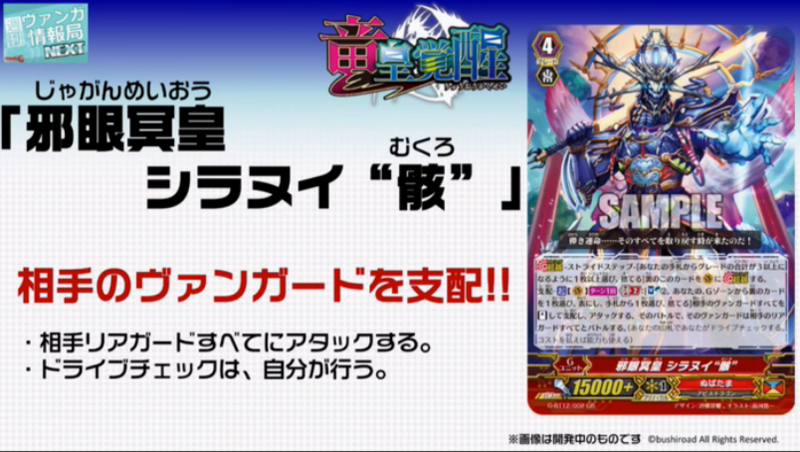 AUTO (RC) 1/Turn GB1: [CB1] During your turn, when a Dominated Unit attacks, you may pay the cost. If you do, you may choose a face-down card in your bind zone, and add it to your hand. If you do, this unit gets Power+10000 until end of turn.